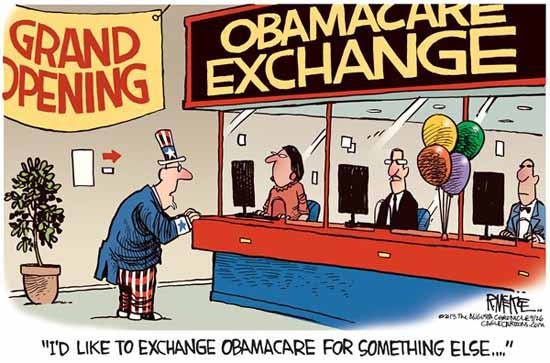 The Obamacare nightmare continues, complete with more negative poll results, declining support from the young, unauthorized debit card charges for premiums, and an outrageous advertising blitz. Nearly half of those with job-based or other private coverage say their policies will be changing next year — mostly for the worse. Sixty-nine percent say their premiums will be going up, while 59 percent say annual deductibles or copayments are increasing. Disapproval of Obama’s handling of health care topped 60 percent in the poll. In the poll, taken just after the revamped federal website was unveiled, 11 percent of Americans said they or someone in their household had tried to sign up for health insurance in the new marketplaces. Sixty-two percent of those said they or the person in their household ran into problems. About one-fourth of all who tried managed to enroll. Half said they were not able to buy insurance, and the remaining quarter said they weren’t sure. Forty-five percent of 18- to 29-year-old Americans say they approve of the way Obama is handling his job; 46% disapprove of his job performance, according to a year-end USA TODAY/Pew Research Center Poll. The president’s approval rating with young Americans — which stood at 67% just ahead of his second inauguration less than a year ago — now mirrors the general population, according to the poll. That’s going to be a big problem for the success of Obamacare – that age group is the one the ACA is depending on to offset the higher risks and costs associated with insuring sicker and older Americans. Extrapolated across the entire U.S., the cost of marketing and advertising to get Americans to sign up for coverage is expected to run into the hundreds of millions of dollars. Here’s a link to all of the federal grants, including marketing funds, allocated to states across the country by the Obama administration to set up marketplaces and educate consumers. Private insurers are also spending big bucks on advertising through channels including radio, TV, billboard, direct mail, and the internet. While the government and private insurers are busy spending millions on promoting Obamacare, consumers are getting hit with unpleasant surprises like higher costs than expected – and early debits for premiums. Consumers in Washington state are reporting billing problems with the Washington Healthplanfinder website. Josh Bruner started his own business this year as an engineering recruiter. They said it’s forced them to pay a lot of attention to their bills and their bank accounts. They aren’t the only ones experiencing billing issues. Others have been billed early – and at least one case of a consumer being double-billed has been reported. Can we scrap this whole thing and go back to how things were now?